The Captain | FLOUNDER GIGGING! ROCKPORT, PORT ARANSAS, CORPUS CHRISTI, TX! FLOUNDER GIGGING! ROCKPORT, PORT ARANSAS, CORPUS CHRISTI, TX! GIG TILL YOU LIMIT OUT OR THE SUN COMES UP! CALL: 361-222-6007!! Capt. James Parbst is a USCG Licensed Flounder Gigging Guide. Looking to hire the best? Look no further than this hired gun of a flounder gigging guide, born in 1978 and gigging ever since. New state laws have been made to protect the flounder and ensure that they are not fished-out every again. Captain James Parbst Guide/Commercial Flounder Gigger and one of the best on the Texas Coast! This guide is great for beginners to advanced fishing and flounder gigging enthusiasts! His motto is “Its all about a great time”!!! He possesses one of the very few commercial licenses left in the state of Texas to commercially gig flounder, which is a huge advantage for anyone who books a trip with him. He does a lot of scouting and exploring while commercial fishing, making it a rarity for a guided trip not to get there limit of flounder. This guide’s knowledge of the water is amazing – from Baffin and Port O Conner to Rockport and Port Aransas – plus all points in between. He always knows where they are so hire him and have a the most productive and fun trip possible. You’ll be in the best hands possible with him!! Captain James makes 100 percent of his living gigging flounder (whether it’s guiding or commercial gigging flounder for the fish houses). And he spends over 300 days a year on the water which qualifies him as a flounder specialist professional. You’ll be glad you made the choice of taking a trip with this captain!!! CHECK OUT THIS CAPTAIN’S FACEBOOK PAGE NOW TO SEE HIS RECENT CATCHES! 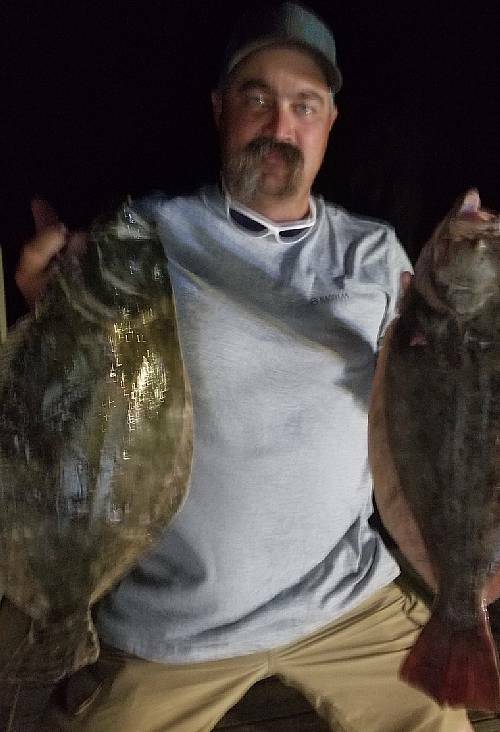 Copyright © 2019 FLOUNDER GIGGING! ROCKPORT, PORT ARANSAS, CORPUS CHRISTI, TX!. Powered by WordPress. Theme: Spacious by ThemeGrill. HARDEST WORKING GUIDE IN TOWN!